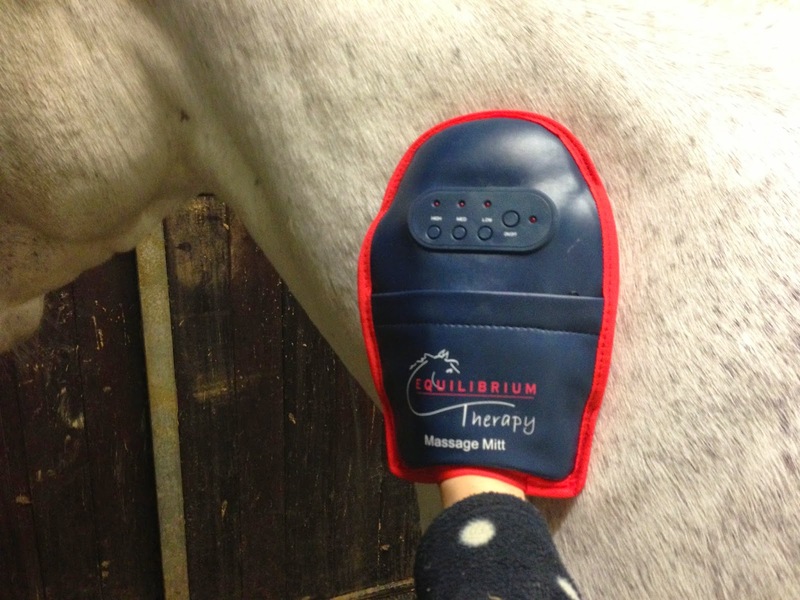 I purchased the Equilibrium Massage Mitt in the sale last year (RRP £95), I love pampering Oscar and the idea of giving him a massage, improving his flexibility, muscle condition and encouraging him to relax with his head dropping and bottom lip wobbling sounded perfect...but things are never that simple with a spooky pony! The Equilibrium Massage Mitt comes with a re-chargeable battery and charger, neatly packed away in a plastic case. After charging I popped my hand in the mitt and tried the settings, low, medium and high, I placed the mitt on my tight shoulders and it felt good, it was lightweight and an easy to clean material - all great so far! Now to introduce the mitt to Oscar, I groomed him first to ensure he was nicely relaxed, got the mitt out, placed it on my hand and allowed Oscar to sniff, snort and jump at it - he is a serious pansy - I then stroked it down his neck, shoulder, quarters and hamstring (switched off) so he could get a feel for it...his body was as stiff as an ironing board at first. Once he realized it wasn't going to kill him I switched it on...thankfully the mitt is quiet and once on, each session lasts 10 minutes then will automatically power off. Oscar didn't fully relax the first, second, third time I used the mitt and even now sometimes looks at it like he has never seen it before when it comes out my grooming bag, because of this reason I never got into good habits of using the mitt on a regular basis until this Summer. After Oscar's quarterly physio session, I asked the physiotherapist how the Equilibrium Massage Mitt could help Oscar and to show me exactly where I should be using it...my physio highlighted areas on a sheet for me to work on, and this gave me the focus I needed to start using the mitt effectively. This completely changed my view on the product and I would like to see Equilibrium provide more guidance of how to use the mitt effectively, as I was lost before, just stroking it over his body as instructed by the YouTube video. I now use my mitt weekly, usually on a night off, I find it too much hassle to use before I ride - my time is limited and after an early start to muck out, a busy day at work, then back to the yard I am realistic about what I have time to do, before I shower and cook dinner ready for it all to start again! I use the medium and high settings most and spend 10 minutes on the neck, shoulder area alternating sides and another 10 minutes on Oscar's back end. I think this goes some way towards helping soften and relax his muscles, he is in great shape and finds bending easy, this has improved in recent months. 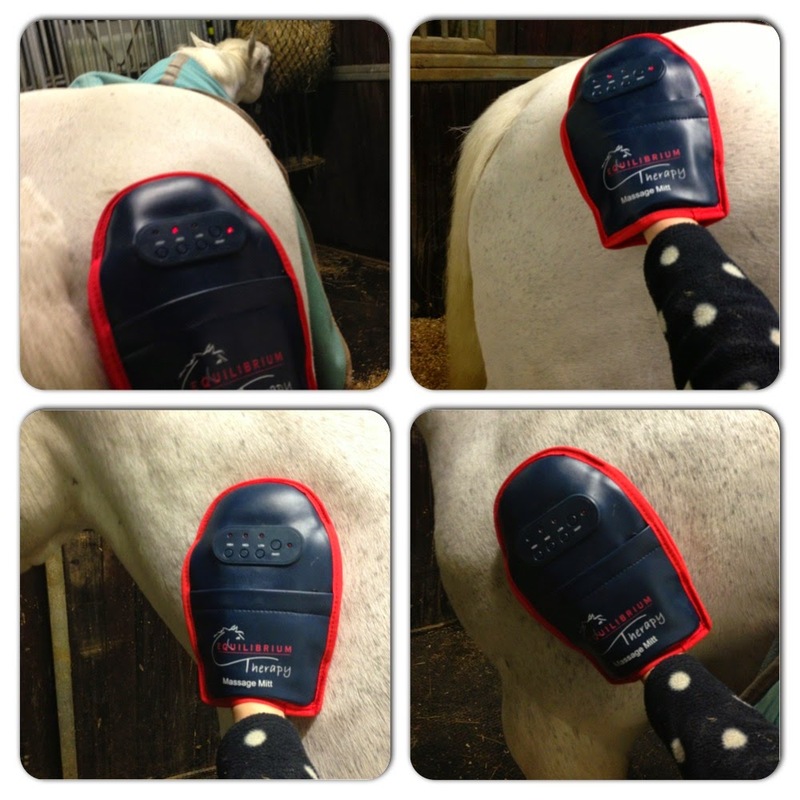 The mitt would also be great to take to competitions to help prepare muscles after being stood on the box. 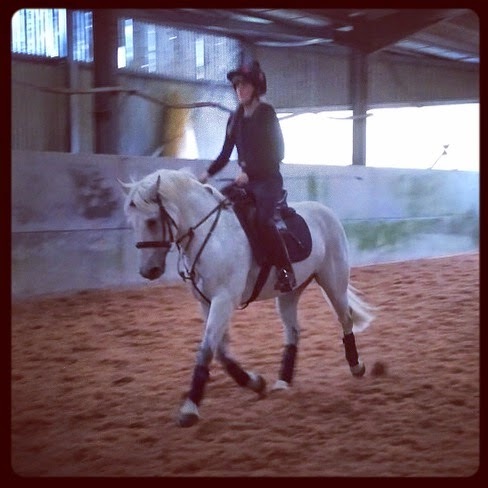 Overall I feel the mitt is a luxury item, not essential and that the Equilibrium Masssage Pad would be more useful and suit my lifestyle more, I could pop it on before/after I ride and continue with my jobs at the yard. I would love to try one ...I am keeping my eyes peeled for one in the coming New Year sales as they RRP at £225.